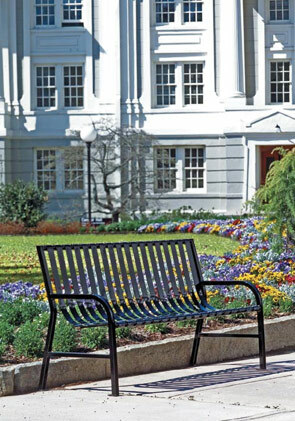 The most basic of the Oakley Collection, this simple park bench is constructed of durable 1/8" x 2" slatted steel that is graffiti resistant and deters vandalism. Flat bar steel is smooth and sturdy providing a comfortable place for the public to sit, rest, and enjoy the surroundings. Furnish the entire area with matching decorative park benches, trash receptacles, and planters to create an atmosphere that can be enjoyed by people of all ages at all times of the year. Available in three different lengths to fit any space, in any of the color options shown below. 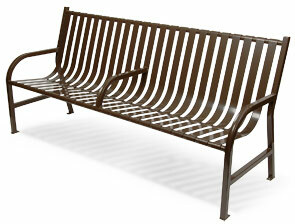 Model M6-BCH-ARM also has an extra armrest located in the center of the park bench for extra stability and comfort. Arms and legs are constructed of 1-1/4" square steel tubing. Predrilled tabs on legs and anchoring kit included. Model M6-BCH-ARM has center arm for added comfort. Matching planters & trash receptacles available.